These tiny, high-torque gearmotors have the highest gear ratio of any motor we sell, which makes them a great choice for applications that require extremely low motor speeds. With no load, the 1000:1 micro metal gearmotor HP output shaft turns at approximately 32 RPM at 6 V, and we were able to achieve rotation rates of around 2.5 RPM at 0.5 V on a test unit (note that performance will vary slightly from unit to unit). The lower-power 1000:1 micro metal gearmotor is even slower, with a no-load rotation rate of approximately 14 RPM at 6 V, and we were able to a achieve smooth rotation speed of around 1 RPM at 0.6 V on a test unit. These motors are intended for use at 6 V, though in general, these kinds of motors can run at voltages above and below this nominal voltage, so they should comfortably operate in the 3 – 9 V range (rotation can start at voltages as low as 0.5 V). Lower voltages might not be practical, and higher voltages could start negatively affecting the life of the motor. The micro metal gearmotors are available in a wide range of gear ratios—from 5:1 up to 1000:1—and offer a choice between two different motors: high-power (HP) and standard. With the exception of the 1000:1 gear ratio versions, all of the micro metal gearmotors have the same physical dimensions, so one version can be easily swapped for another if your design requirements change. Please see the micro metal gearmotor comparison table for detailed specifications of all our micro metal gearmotors. This dynamically-sortable table can help you find the gearmotor that offers the best blend of speed, torque, and current-draw for your particular application. A more basic comparison table is available below. The diagram below shows the dimensions for this gearmotor. The 1000:1 gear ratio version of the micro metal gearmotor has a longer gearbox than other micro metal gearmotor versions (12.5 mm for the 1000:1 compared to 9 mm for all gear ratios). All the other dimensions match those of the other micro metal gearmotor versions. 1000:1 micro metal gearmotor dimensions (units in mm). The gearbox has a long (0.365" or 9.27 mm), 3 mm-diameter D-shaped metal output shaft, and the brass faceplate has two mounting holes threaded for M1.6 screws (1.6 mm diameter, 0.35 mm thread pitch). It weighs approximately 0.37 oz (11 g). Note: Due to the longer gearbox, the 1000:1 micro metal gearmotors do not work with the encoder for Pololu wheel 42×19mm. These gearmotors can be used with our micro metal gearmotor bracket and extended bracket, but these brackets will not cover the entire gearbox the way they do when used with other gear ratios of micro metal gearmotors. Wheels and Hubs: The micro metal gearmotor’s output shaft matches our assortment of Pololu wheels and the Solarbotics RW2 rubber wheel. You can also use thePololu universal mounting hub to mount custom wheels and mechanism to the micro metal gearmotor’s output shaft. Mounting Brackets: Our mounting bracket (also available in white) and extended mounting bracket make it easy to mount the gearmotor. We recommend theextended mounting bracket for wheels with recessed hubs, such as the Pololu wheel 42×19mm. Note that when used with the longer gearbox found on the 1000:1 gear ratio version of the micro metal gearmotor, these brackets do not fully enclose the exposed gears they way they do in the right picture below. 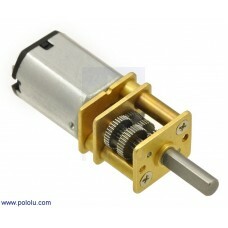 This picture shows another version of the micro metal gearmotor.